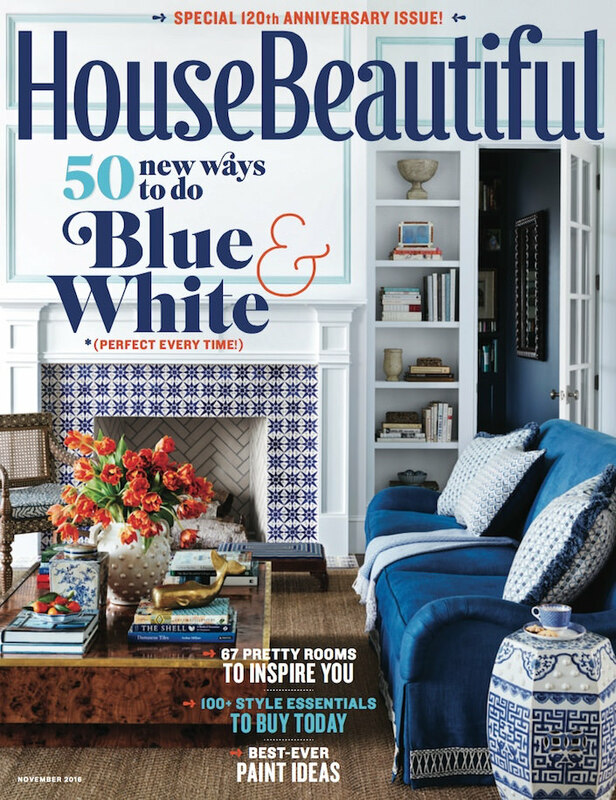 As America’s longest published home magazine, House Beautiful celebrates 120 colorful years in its upcoming November issue. Since 1896, the magazine has been connecting with readers, offering inspiration and ideas for decorating, entertaining and living with happy personal style. I recently spoke with Sophie Donelson, Editor in Chief, about the anniversary issue and enduring appeal of the magazine. 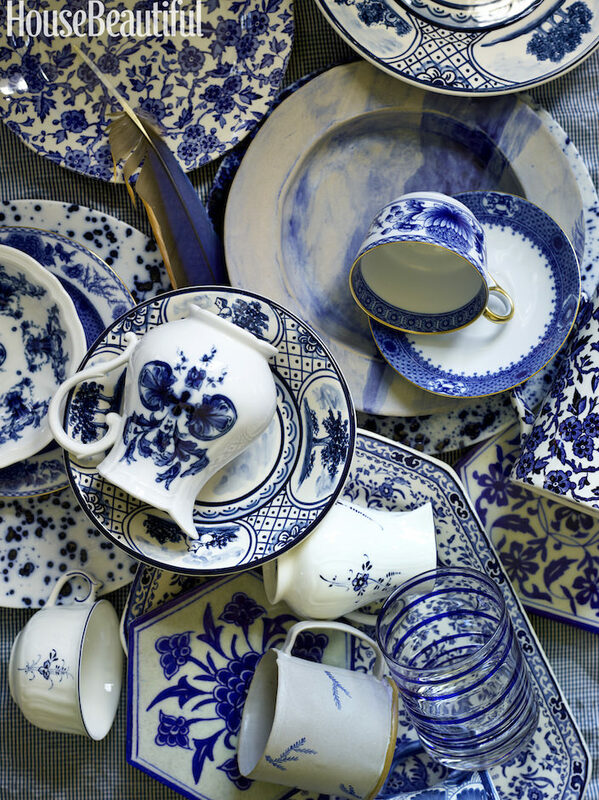 The passion for color has been an integral part of the magazine from the start and no color scheme has been more beloved than blue and white. It’s a major theme in the issue, starting with the cover. 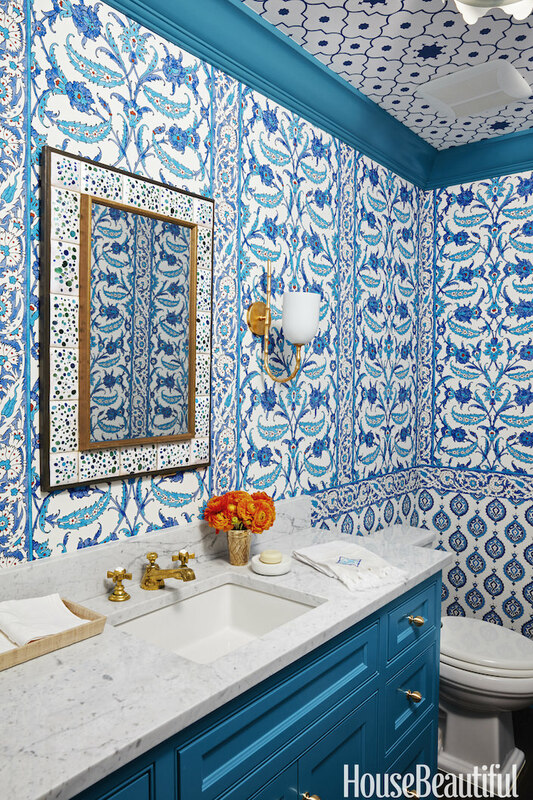 This beachside home by Florida designer Andrew Howard proves how this classic color combo can be bold, daring, fresh and still sophisticated. The perfect solution for the windowless powder room, above? Andrew says “Go big!” Three different wallpapers, a vintage blue and green speckled mirror and electric teal paint later and you have a little haven of exotic heaven. 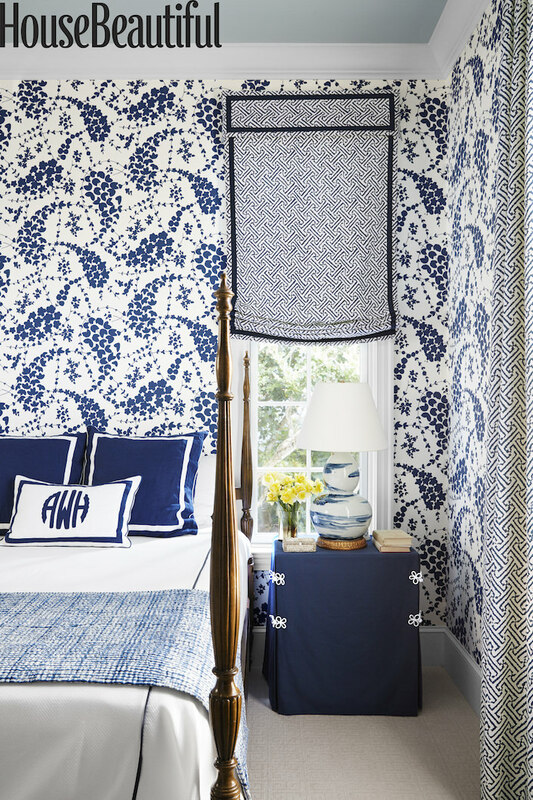 Who wouldn’t want to stay in this pattern-happy guest bedroom where Quadrille‘s Java Grande (shade and curtains) and Lysette (walls) effortlessly mix with Leontine Linens and Bunny Williams Home’s timeless Brushstroke lamp. 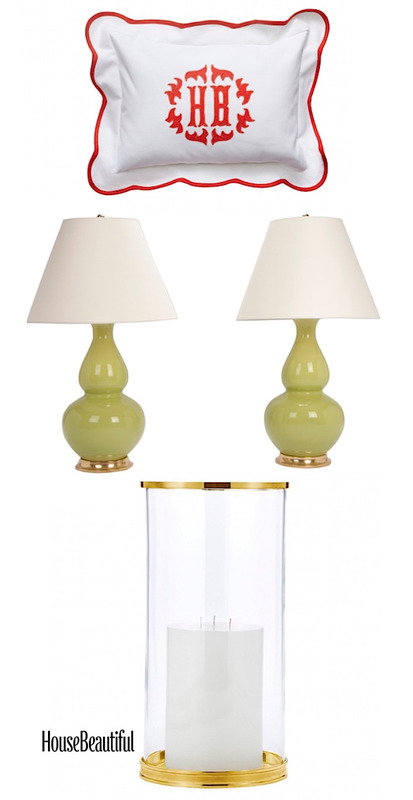 Looking for bedside storage that is easy and chic? This tailored table provides the solution in style with a Duralee cotton duck embellished with chic Samuel & Sons Harbour Crown Knot Frogs. While there are many tangible takeaways in this issue, like the creative ideas above, there are also some more ethereal treats. 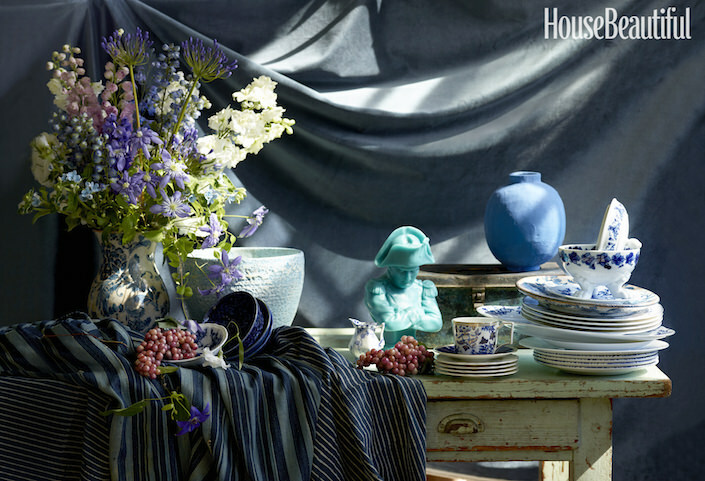 Rhapsody in Blue and White was a personal project for the art department and editorial team. Inspired by so many beautiful photographic editorials over the years that have appeared in mostly European magazines, House Beautiful assembled a dream team to produce a glorious ten page story that Sophie describes as “beauty for beauty’s sake.” Photographer and textile artist Martyn Thompson and stylist Jeffrey W. Miller collaborated on the piece, pages from it above and below, to commemorate the magazine’s special anniversary issue. In thinking about what differentiates House Beautiful, Sophie answered that it’s “The strong belief that investing in home, educating yourself and doing just a little better than you have to pays off immensely. 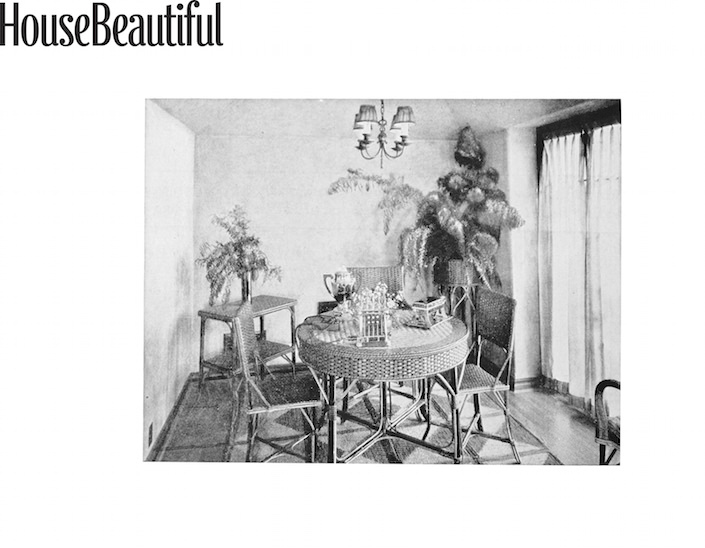 House Beautiful is one of the last standing magazines that enjoys and gets away with geeking out about design and decoration. We and our readers are unapologetically passionate hobbyists about design. We may not be professional designers but we love tinkering around our homes. The magazine is not just about getting the design job done, it’s for people who truly love decorating. And we reward smart readers who can look past the price point and find the insight. Our readers understand how to interpret.” So to tie it all together with actionable picks, House Beautiful has assembled a best of the best list of 120 iconic must-buy favorites that will stand the test of time, including three personal favorites, above, from top to bottom, Personalized Bed Linens (Leontine Linens Celeste Applique boudoir pillow), Gourd Lamps (Christopher Spitzmiller’s elegant Aurora) and Hurricanes (Ralph Lauren Home’s Modern Hurricane). This entry posted in interior design. Entry Tags: anniversary issue, Decorating, House Beautiful, interior design, magazines, Sophie Donelson Bookmark the permalink. How awesome — I can’t wait to get my issue in the mail. Especially because we are currently contemplating the windowless powder room in our new house! 80 queries in 0.475 seconds.